If you live near Stratham, Portsmouth, or Exeter and you’re looking for brake repair services, our team at BMW of Stratham is here to help! Having your brakes inspected and repaired periodically is the key to keeping your car ready for the road ahead. This page will give you a closer look at what we mean when we say, brake repair near me. Learn exactly how our maintenance services can benefit customers like you, and feel free to give us a call if you have questions. Continue reading to learn more about BMW brake repair! When you use the brakes, all you need to do is press down the brake pedal-but on the mechanical end, there’s a lot more to it than that. Your braking system has a variety of parts working together to help bring your car to a halt, including brake pads, hoses, and lines, along with calipers and rotors. 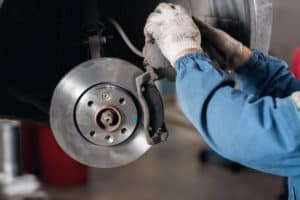 When our experienced technicians examine your brakes, you can rest assured that they’ll use only state-of-the-art tools and technology to diagnose and fix any problems they find. They’ll delve into every moving part to see what may be causing any brake troubles you’re experiencing. Our maintenance professionals know you can’t wait around forever while your vehicle’s in the shop. That’s why we offer BMW FastService®, a package designed to get you and your ride in and out as quickly as we can. With a whole pit crew working on your car, we’ll make short work of the brake repair you need. Not only does FastService® cover brake pad installations, but it also applies to several other maintenance services you may need, like oil changes, tire replacements, fluid flushes, and more! You’ll appreciate our quick, quality repairs that get you back out on the road, sooner. Sometimes, a brake inspection will show that no repair or replacement is necessary-perhaps your brake fluid just needed to be topped off, or maybe the real problem was discovered in another vehicle system. However, if you do need replacement parts, you’ll be pleased to hear that we only use genuine OEM parts for quality assurance. That means the brake pads or rotors we install will meet your vehicle’s exact specifications. With factory-made parts, you can gain peace of mind from repairs that will last longer and retain exceptional quality throughout their lifetime. It’s all part of our dedication to serving you! Now that you have a clearer picture of what our brake repair & BMW brake repair services can do for you, we hope you’ll stop by the next time your car is due for a brake inspection. Our team is trained, experienced, and certified to handle the job at hand. You’ll benefit from the speedy maintenance delivered by BMW of Stratham, your dealer serving drivers from Stratham, Portsmouth, Exeter, and beyond. Give us a call to speak with a member of our team or schedule a service appointment right from our website!